The first lines in the first song Robert Plant sings at Led Zeppelin’s reunion show, their first full-length concert since they dissolved in 1980, are “In the days of my youth/I was told what it means to be a man.” The first lines in the last song of the night are “It’s been a long time since I Rock and Rolled.” Both lyrics have become even more fitting as time moved forward. Plant, in his late 50s when the concert happened, sings those lines with a sense of maturity, aged wisdom and astonishingly youthful power in one of the best reunions of all time. When Plant, Jimmy Page, John Paul Jones and John’s Bonham’s son, Jason, announced their re-emergence in honor of late music executive Ahmet Ertegun in 2007, it effectively stopped the music world in its tracks. All attention swiveled over to the The O2 Arena and speculation ran rampant over everything from the set list to the lighting. Past Led Zeppelin reunions didn’t really turn out well for a number of reasons. This was the band’s chance to set the record straight and show they could still perform at the level that made them famous. Any fears or worries are proven to be unfounded within the first song of Celebration Day. Zeppelin rips through Good Times Bad Times with such as much fierceness as they had in their youth. Page’s guitar snarls. Jones’ bass rumbles. Bonham’ drumkit stomps. As for Plant, he throws everything he has into the performance, singing at heights unheard of for someone who is supposed to be decades past his prime. The concert’s highlight comes during Kashmir, which closes the main set. All surviving members of the band have at various points called the song one of their most definitive. It shows. Have any doubter or hater listen to this performance and watch as they realize the error of their ways. The band sounds tighter, sharper, more ferocious and at the same time, looser than they ever have before. It’s one of those classic moments where the live version exceeds the studio version. The first of the concert is just as jaw-droppingly amazing. The set list runs the gamut from hits like Stairway to Heaven and Whole Lotta Love to rarities like Misty Mountain Hop and For Your Life, played live for the first time ever. All of their albums are represented here, except for In Through the Out Door. 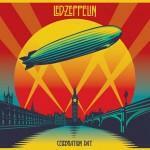 After listening to this set, your thoughts may be conflicted on Led Zeppelin’s future. On one hand, seeing how strongly the band played, a reunion tour seems like an excellent idea. On the other hand, this album is so strong partly because of its once-in-a-lifetime nature. Regardless of what the future holds for Led Zeppelin, the record shows that this single concert in the O2 Arena certainly was a celebration day for all.